Choose the amber glass straight sided jars in bulk to purchase at wholesale prices. 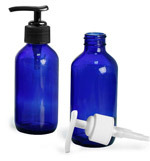 Select compatible closures for these amber glass jars by clicking on Add-ons below. The 2 oz amber glass jar was replaced with a new jar as of February 6th, 2018. Amber glass straight sided jars are paired here with white ribbed teflon lined caps made from polypropylene. 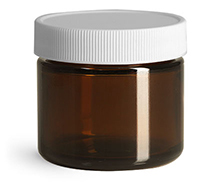 Amber glass jars feature thick walls that provide UV protection, and are nonporous and impermeable. The white ribbed caps include teflon faced liners that provide superior chemical resistance and can withstand compounds that could degrade other liners. SKS highly suggest testing your ingredients to ensure complete compatibility.